All transactions are safe and secure with a reliable history in online sales behind each of our associates. 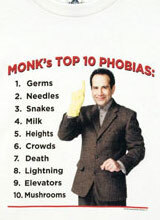 Buy Monk shirts and choose from the list of Monk's phobias and Monk's favorite quotes. "You'll thank me later." 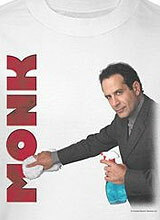 The Monk TV show is a comedy series about San Francisco detective Adrian Monk (Tony Shalhoub). 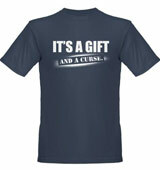 Monk's uncanny ability to solve crimes is aided by what hinders him in daily life, obsessive compulsive disorder. 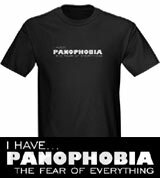 Monk is plagued by a variety of phobias, and he is haunted by the death of his wife, Trudy, the one case he is unable to solve. Monk's counterparts, including assistant Natalie Teeger (Traylor Howard), former boss Leland Stottlemeyer and friend Randy Disher keep Adrian afloat and often alive. Crack open a bottle of Monk's favorite beverage, Sierra Springs, and investigate our attractive selection of Monk t-shirts below. 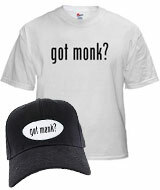 Got Monk? 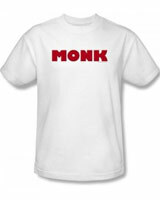 Fans can never get enough of the Monk USA TV show. 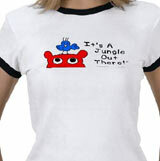 This is a cute parody of the "got milk" ads prevalent today. 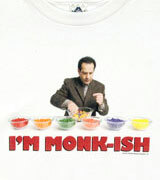 Although we know Adrian Monk (Tony Shalhoub) would never approve of having a milk mustache, I think he would find this Monk tee perfectly acceptable. Just like milk makes you strong, with Monk episodes you'll never go wrong. Consume until you get your fill. 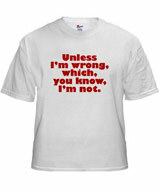 Browse to see hats. 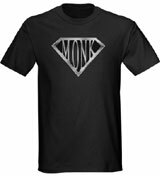 Link to: Got Monk?